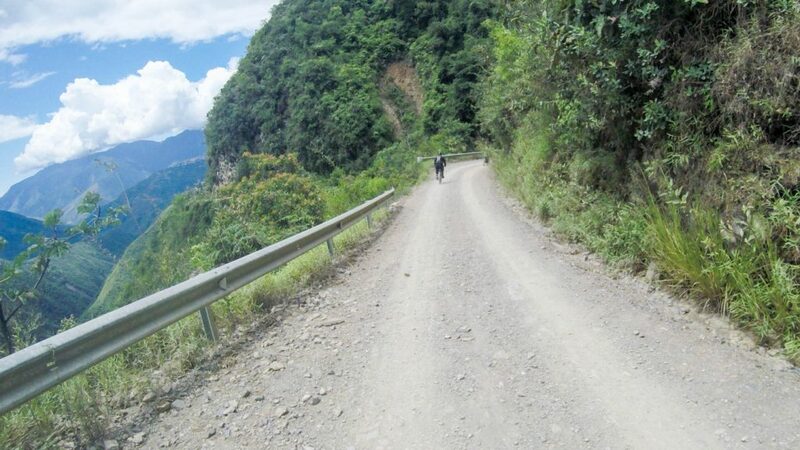 Biking the World’s Most Dangerous Road with Altitude Adventures » Lavi was here. I am a “yes” girl. I am an adrenaline junkie and will say yes to almost anything that will scare me and throw me out of my comfort zone. So when I decided to go to Bolivia and read about the “World’s Most Dangerous Road”, I not only said yes, I said “hell yes”. 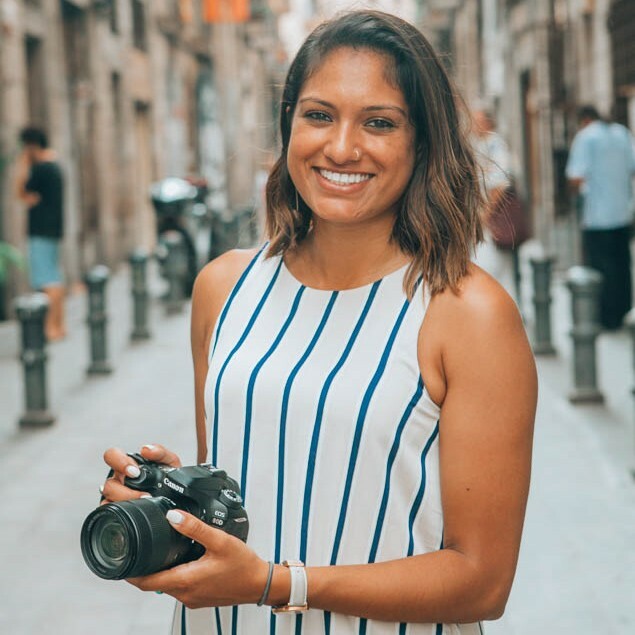 After my stressful experience crossing the border from Peru to Bolivia, my BFF Steph arrived in La Paz to travel with me for a few weeks. 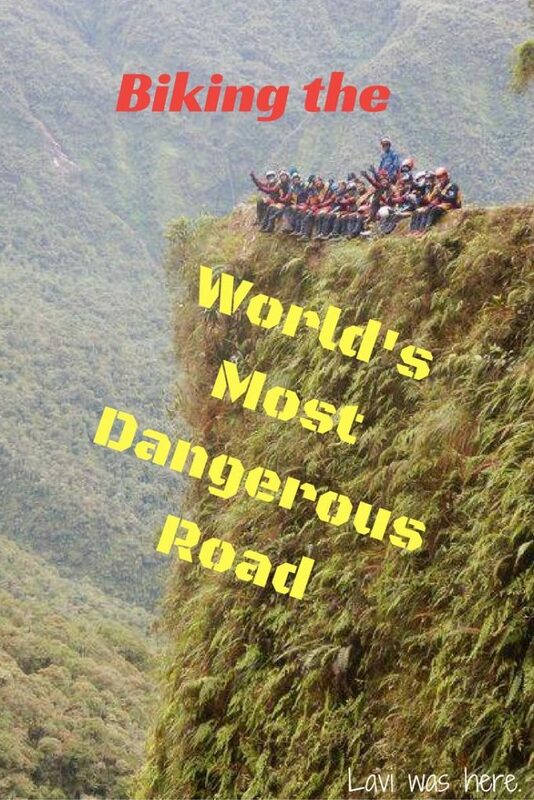 One of the first activities on our itinerary was biking the World’s Most Dangerous Road. 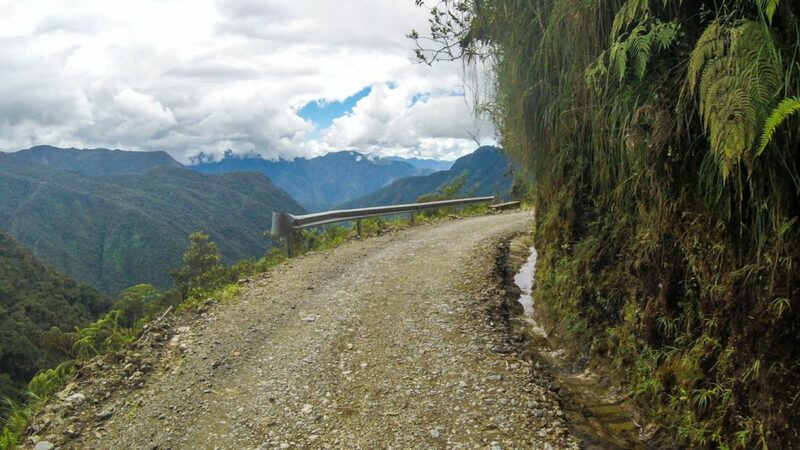 Once the main route from La Paz to ­­­­Coroico towards northeastern Bolivia, Yungas Road (aka Camino de la Muerte, aka Death Road), it’s estimated that about 200 to 300 travelers were killed per year on this treacherous gravel path along the mountain pass, La Cumbre. In person, it was easy to see why about 29 vehicles fell over the edge of the cliff face. This road meant for two-lane traffic is hardly wide enough for one! With few guard rails to offer any support, I would never ride in a vehicle on this road, even on the inside of the curves. Now that a new and safer road was built to manage this traffic, Death Road isn’t used as often for motor vehicle traffic. 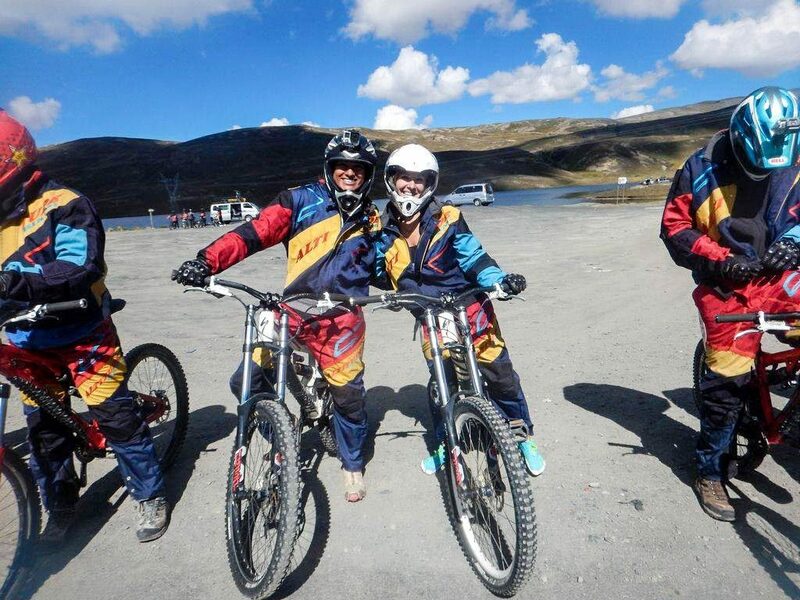 One of the highlights of visiting La Paz is a mountain biking excursion down the road. So naturally, Steph and I signed up. 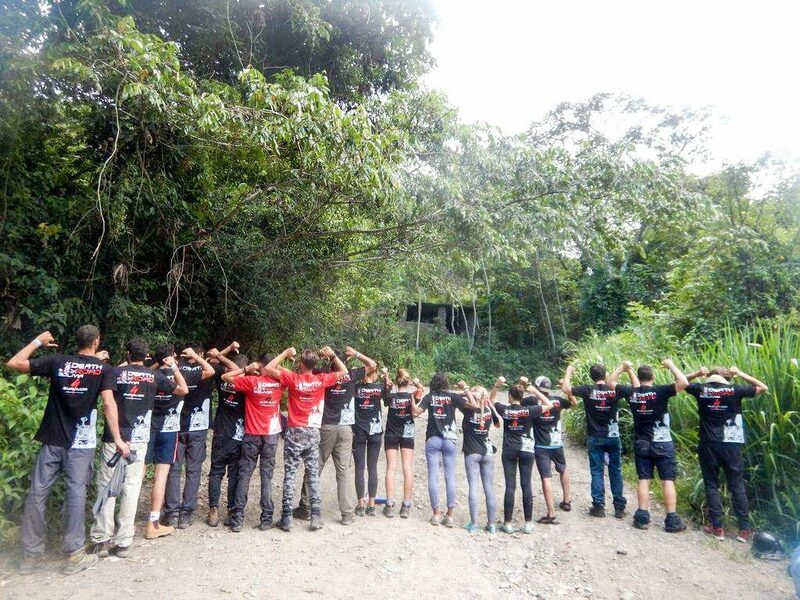 Everyone in our hostel went on Death Road biking tours, so we asked around and heard reviews from friends about the best companies. We decided to prioritize safety over budget and right off the bat, someone chimed in saying we had to go with Altitude Adventures. When we went to the office and spoke to the Altitude representatives, we knew we’d made the right choice. The company offers the top of the line gear from head to toe and specialized mountain bikes with front and rear suspension and hydraulic brakes. We’d heard from our friends that some companies only offered mountain biking helmets and a few didn’t even provide enough protective pads and clothing. Altitude assured us that we were in good hands as we signed out waivers and were outfitted for helmets and clothing. 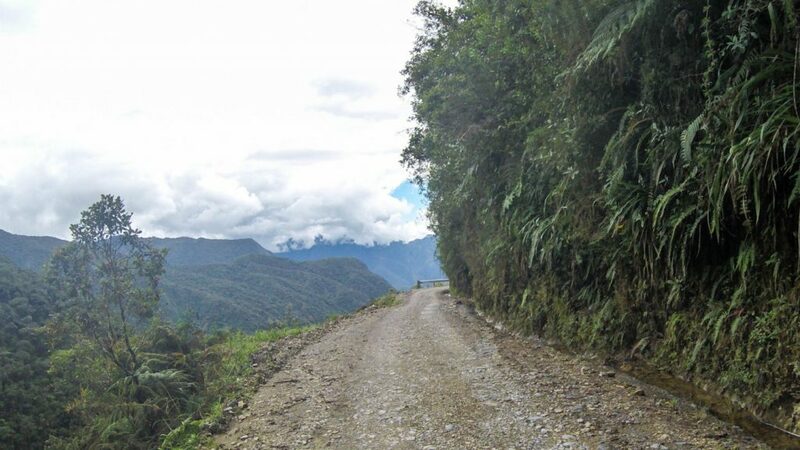 We were picked up early in the morning and driven to the new highway near Death Road. We tried on our gear, ate a simple breakfast, and tried out our bikes. 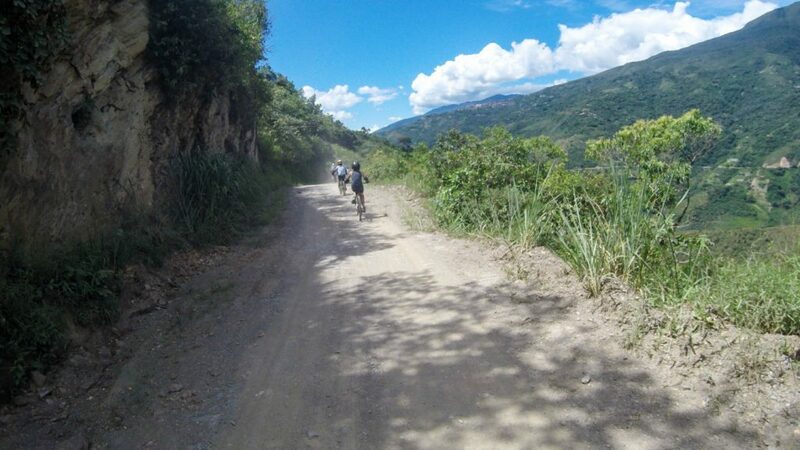 Once we were all ready, we began our bicycle ride down the new highway toward the old Death Road. For our safety, there was always a support vehicle driving behind the last riders in case anyone got injured. The ride was breathtaking. It was easy to steer on the smooth, paved new highway, so I took a moment to take in my surroundings. 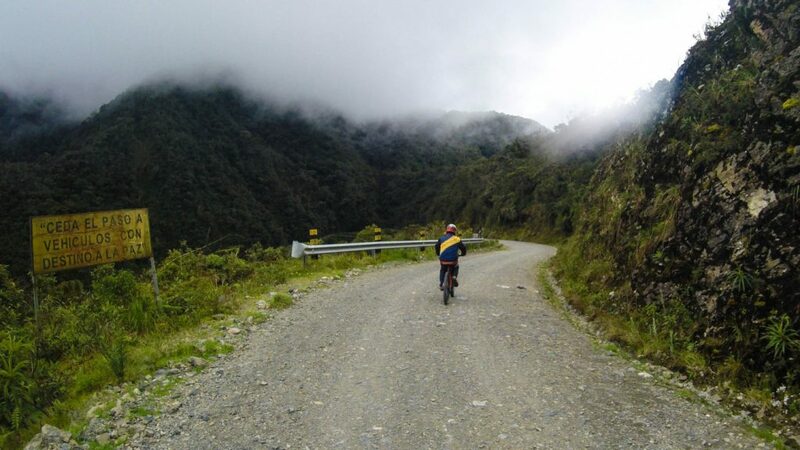 Biking in Bolivia’s mountains is really a once in a lifetime adventure! 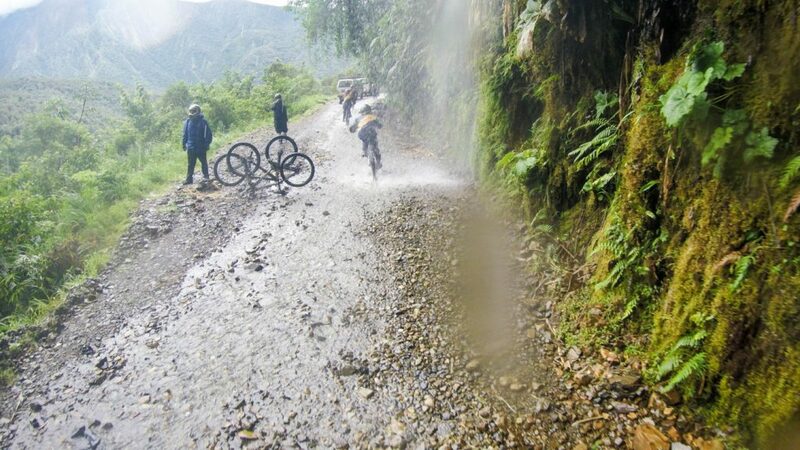 It began to rain as we turned onto the gravel path of Death Road. Oddly enough, our guides told us to ride on the side of the road closest to the cliff because it was safer, so we took off. It’s difficult to think about how scary something is when you’re right in the thick of it. I focused my attention on the road and enjoying the experience. The road was beautiful, especially in the ominous fog we started with. 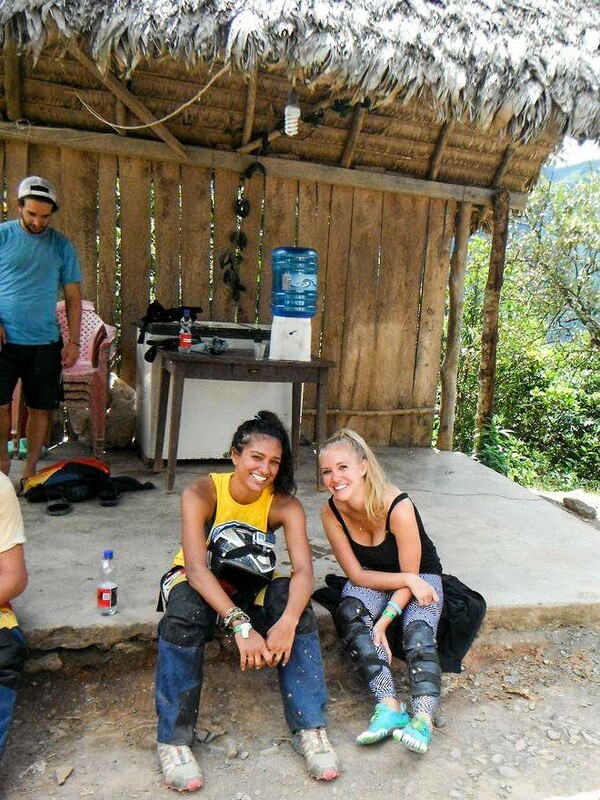 We took breaks along the way every 15 minutes or half an hour and our guides checked in on all of us to make sure we were doing OK.
We rode along the cliff, under waterfalls, and around sharp bends. Steph and I were riding quite fast but still were behind the large group of adventurous post-military Israeli guys in our group who scared the crap out of me every time they sped by when we started off from our breaks. We had a good group though; everyone was willing to look out for one another. Our guides had us stop for a few cool photo-ops along the way, too! 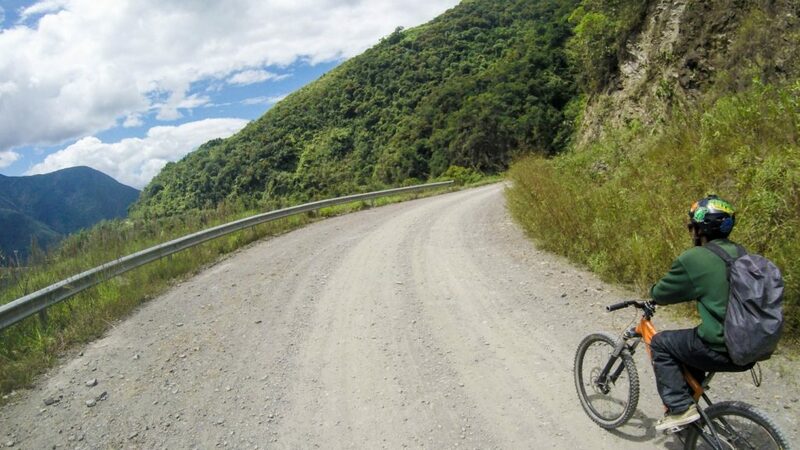 Although it was obviously much safer to ride a mountain bike down Death Road, my heart skipped a beat a few times as I realized it was much safer to let my momentum die down instead of actually braking on the gravel road. I literally had to just ride it out and steer if I ever wanted to slow down. Every now and then my back tire slipped from under me, but I’m utterly shocked that I made it down the road 62 kilometers and a few hours later completely unscathed. It started to get really hot as the sun came out. We removed our layers and jackets but kept our pads and gloves on. I knew if I fell at this point, it would do some real damage to my arms since I was only wearing my cutoff Inca Kola T-shirt. The ride was much less scary when we took a left turn and were riding with the cliff face to our right. Before I knew it, we arrived at the bottom and were clinking our beers together to celebrate conquering the World’s Most Dangerous Road. After our day long mountain biking trip, we stopped off to have lunch take a dip in a swimming pool, and shower off the sweat from those nerve-wracking moments when I thought I might careen off the cliff. This day was one for the books. Our Altitude Adventures guides were fantastic. We had all the water we needed, they constantly checked in our gear and the support vehicle was not far behind us in case we needed it. One of the coolest things about the tour with Altitude Adventures was that we didn’t need to bring cameras to capture the experience. Although I brought my GoPro Hero4 Silver , one of our guides was taking photos for us along the way! Our safety gear was without question the most secure out of the other tour groups joining us down the World’s Most Dangerous Road that day. We were completely protected from the elements in our full-face helmet, gloves, jacket and pants. I doubt I would have gotten seriously hurt with the elbow and knee pads I was sporting underneath. 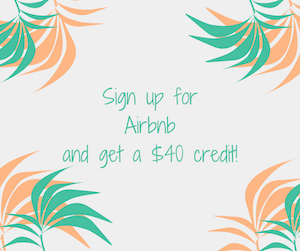 Includes: pickup and drop off at your accommodation, full face helmet, gloves, knee pads, elbow pads, jacket, pants, water, breakfast, three snacks, a buffet lunch and option to swim and shower after. And a free T-shirt! Make sure your helmet size is correct. My helmet was slightly big and slid down over my eyes a few times (eek! ), so make sure your head fits snugly inside so that you can see where you’re riding! It will probably be cold when you start your day, but you’ll warm up as you begin biking down the road. Almost all of us removed our jackets and kept our pads on. Bring layers so you can keep them in the van. Many thanks to Altitude Adventures for hosting me. But don’t worry; no matter who foots the bill, I’ll always keep it real and provide my honest opinion of my experiences. That looked awesome! 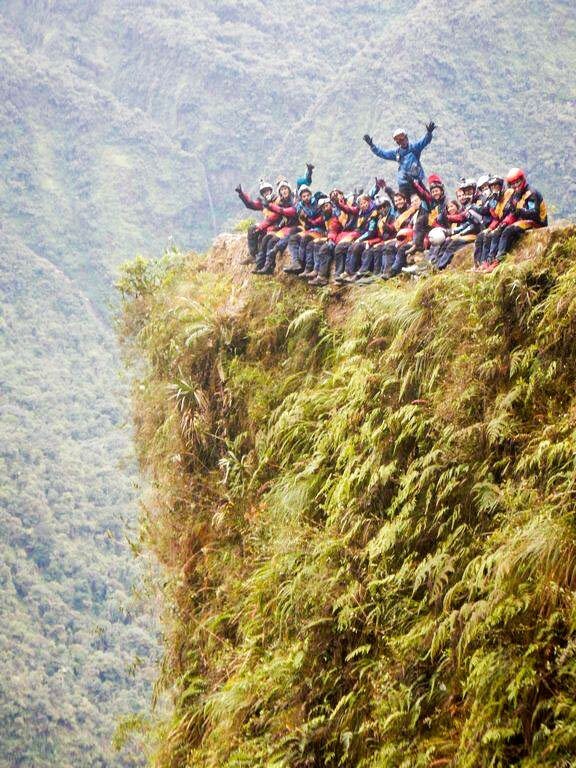 I’ve been hearing a lot about Altitude Adventures as I’m planning on going to Bolivia early next year to experience Death Road. Your post just made me more excited for my trip! It was such a great trip! Altitude is really the best company to book it with. 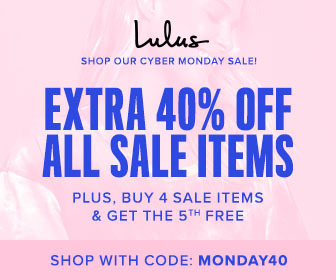 Enjoy, and you’ll have to let me know how it goes! Thanks, Romano! It was a blast! I hope you get to go sometime!